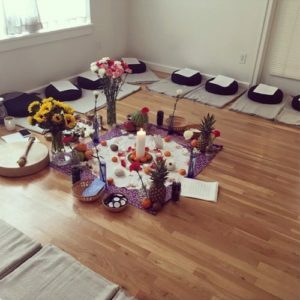 The Help Your Self Closing ceremony – location of my first shamanic journey. We sat in a circle facing a display of gourds, oranges, pineapples, watermelons, flowers, rose petals, and candles. Closing our eyes, we prepared for the shamanic journey. We were told that during the journey, we’d meet our own unique guide to take us through. Maybe we’d see it in our mind’s eye or hear it or just somehow sense and know it. I figured mine would be a lion because I’ve always had a thing for lions, but as the shamanic drum began to beat, my guide arrived – in the shape of a hummingbird. With my eyes still closed, I saw it clearly in my mind. It led me down a white marble spiral staircase into a garden. We were then told to ask our guide how we can best use our creative energy, and so, I asked the bird. First, it showed me a pregnant version of myself. Then it showed me giving birth. Now, as someone who doesn’t plan to have children, this was somewhat disconcerting. I wasn’t sure what to make of it, but as I soon learned, the journey wasn’t over then. That same night, one of my best friends arrived in town. On her third night, we made plans to meet a friend in Manhattan. We settled on a random hotel bar spat out by Google. Now I don’t typically go to hotel bars or to that part of town, but we were all headed in different directions afterward, and this spot was convenient. One drink later, I walked toward the bathroom. 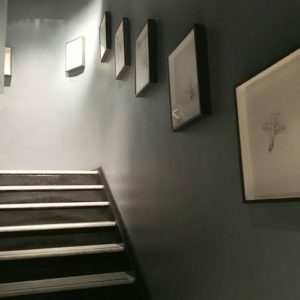 It was located through the bar, through the hotel restaurant, through the lobby, around the corner, and down a flight of stairs. The white marble staircase spiraled down beneath my feet, and along the wall of the staircase was a series of framed images of a single hummingbird. From frame to frame, the hummingbird appeared to be flitting and fluttering down the stairs with me. Hummingbirds lining the wall of the marble staircase at The NoMad Hotel. My heart raced with excitement and wondered what it meant. Four days later, I went to the doctor. I’d been experiencing strange symptoms for the last six weeks and just wanted to make sure everything was okay. All of my tests came back normal with the exception of a small cyst that was discovered on my right ovary. Two months earlier, I’d visited a facialist. After our session, she confided in me that she had the strong sense that something was wrong with one of my ovaries. I didn’t go to the doctor then because I didn’t have any symptoms, but here I was, two months later, with a cyst giving me trouble. The day after my doctor’s appointment, I met with a woman whom I’d randomly connected with via Instagram. I’d never met anyone from an online app before, and I’m not exactly sure what compelled me to meet her, but here I was. Soon after she arrived, I learned that she’s trained in shamanic traditions. I told her about seeing the hummingbird in the hotel after my journey. She laughed and told me that she had a hummingbird calendar on her wall at home. Someone had randomly given it to her as a gift. And that’s how one week later, I took my second journey. This time with her. I entered her home and saw the hummingbird calendar on the wall. I lay on the floor – surrounded by rose quartz and selenite sticks – and closed my eyes. She didn’t say a word along the way. She merely shook a turtle-shell rattle and let the journey guide itself. The hummingbird arrived again, but this time, it was huge – far bigger than me and green with a red throat. I climbed onto its back, and it flew me over a cliff and over a body of water until we reached the entrance of a cave. Deep inside the cave, I uncovered a large, red ruby. A shadowy female figure led me through the cave and into an ethereal land. There, I stayed with her and a shadowy male figure in a castle-like structure in the mountains. Up there, everything was beautiful. Made of dark wood and gold and richly colored fabrics. I was happy and wanted to stay, but I was also aware of how time was passing below and how I had to return. Before I left, she released a snake that crawled down my throat and into my uterus. It stayed inside me for awhile until she carefully removed it. But before she did, the snake shed a layer of its skin inside me to slowly decay. As I traveled back down the mountain, I turned and looked back at the shadowy figures, and I asked, What are your names? We have no name, they uttered. We have no name. We have no name. The hummingbird was waiting for me on the other side. I told it that I was too tired for a long journey. The bird said that was okay, that I could sleep along the way. I climbed on its back and fell asleep as we returned to where we began. I opened my eyes, and somehow, I could still feel the sensation of the snakeskin breaking down inside me. It felt powerful, and I had the strong sense that this meant the cyst was healing. And maybe the feeling of the “snakeskin” was actually the cyst breaking down – or something. That night, I researched hummingbirds – a species I previously knew nothing about other than that they are small birds whose wings move quickly. Right away, I saw a Google image of a ruby-throated hummingbird, They’re green with red throats just like the one in my journey, but their red is known as ruby – just like the stone. I learned that its wings move in a figure-eight infinity pattern, just like the one I have drawn on the chalkboard above my desk and hidden in the tattoo on my wrist. Hummingbirds have a biological uniqueness that allows them to reach the nectar in hard-to-reach places – like deep inside caves and in ethereal lands – and that as a rule, they reject anything but the sweetest nectar. I also found out that with the exception of insects, hummingbirds have the highest metabolism of all animals. This allows them to travel incredible distances – such as over the Gulf of Mexico or over a cliff, across a body of water, to the entrance of a cave – in one nonstop flight. They also have impeccable vision. This allows them to make sense of the world even at their top speeds. Their super-sensitive sight allows them to make out rapidly moving objects and to see the color of ultraviolet light. In other words, they can see things that most creatures cannot. 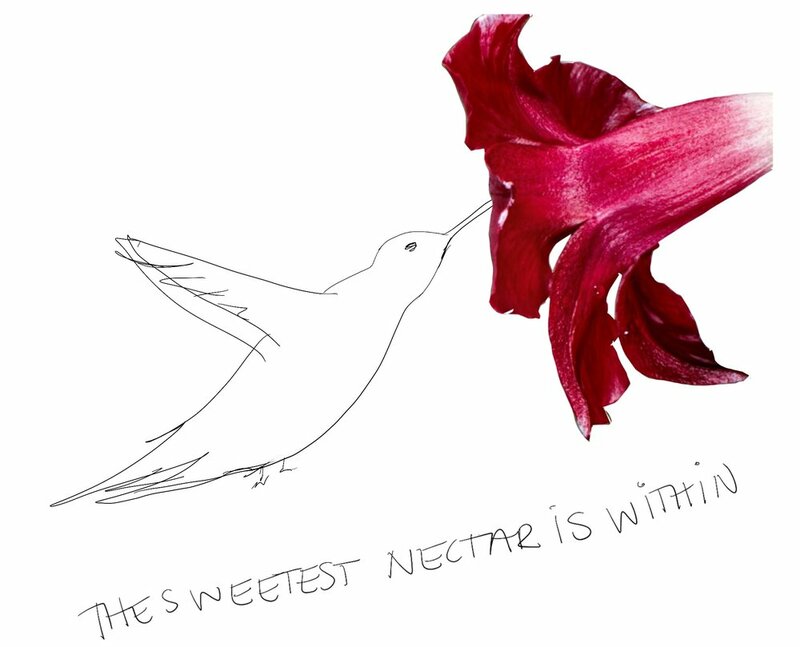 In shamanic totem animal theory, hummingbirds are thought to connect us to our joy. They teach us about how we expend our energy, how we see the world, and how to move quickly between various things. 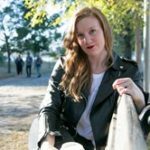 On both of my two journeys, the hummingbird directed my attention to my reproductive region – just as the facialist had two months earlier and where I was apparently struggling with a cyst. In energy theory, reproduction is considered another mode of creative expression. And the second chakra, located in the pelvic area, holds our creative energy. Earlier this week, I received an email from Flo Living, a resource for tracking and understanding the feminine cycle. They featured an article describing how in psychosomatic theory, ovarian cysts are linked to unfulfilled creative expression. So what’s the lesson? Healing this region and letting my creativity out? Well, since the second journey, the symptoms that had sent me to the doctor have disappeared. And on the night of the first journey, I met someone. 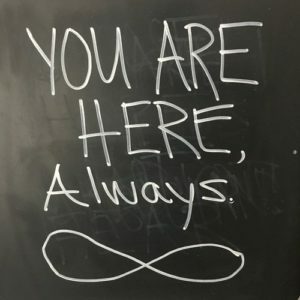 The infinity symbol on the chalkboard above my desk. He was sitting just a few spots down from me in the circle. Afterward, we got to talking. It turns out we are both musicians. He plays guitar. I write and sing. Last year, writing music consumed almost all of my attention. I desperately sought a guitarist to collaborate with but never found the right fit. I turned my attention to my business and stopped actively searching for collaborators. Now, it’s too soon to say where all of this is heading and knock on wood, but what I do know is that last week, he and I got together to jam. Our session overflowed with synchronicity, He offered to help bring my songs to life, and together, we’re going to create some music. I teach women how to embrace their intuitive powers and work their magic.